Donny Daughenbaugh (pronounced doffenbah) was born and raised in Des Moines, Iowa, and today, like many former military personnel, lives in Texas. “I’m still a Yankee by Texas standards,” he said, “but I am working on that.” Donny enrolled in ROTC while attending Lincoln High School in Des Moines. He had little military tradition in his family but he was attracted to the discipline and military principles offered by the ROTC program. After going through basic training in San Diego and completing training, he began working as an apprentice for a carpenters’ union in Des Moines. He became an accomplished carpenter doing both finished work and rough-ins. He had a viable work skill and was earning a decent living. Somewhere along the line he met and fell in love with the woman who would become his wife – Sarah – an insurance claims representative. In February 2004, Donny and his fellow Marines in the Reserve heard they might get activated due to the conflicts in Iraq and Afghanistan. On June 1 they were activated at Camp Pendleton in California. They spent a long summer in rigorous infantry training and by September were posted to Iraq. In Des Moines, Donny met some people from the Coalition to Salute America’s Heroes that hosted him and his family at ball games and other social events where other wounded veterans were assembled. He began with the Coalition as a volunteer, helping to provide outreach to wounded veterans that were unaware of the services offered. 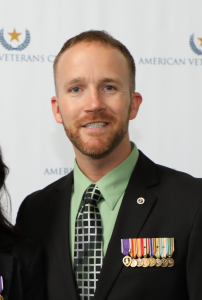 His volunteer work led him to a position within the Coalition’s work from home program, now called the Heroes Thanking Heroes program. Donny was able to learn early on the importance of a personal connection with the donors that make the Coalition’s programs possible. Today Donny serves as the Regional Vice President of the East. His area of responsibility – as he as he puts it “everything east of the Mississippi” – from outreach at VA hospitals, immediate peer to peer support and the ability to address the less demanding financial needs of wounded veterans.